News Flash: I know where Santa spends the off-season. Two days a week, he’s at the solid waste convenience center on Dacco Quarry Road, manning the paint recycling site. I know this because I’ve met him. A couple of months back, while at the convenience center to dump my trash, I noticed a little red building near the entrance gate. MERRY CHIRSTMAS the sign under one window said. Beneath the other was a sign that read SANTA HOUSE. Hot on the trail of a column, I asked attendant James Smith about it. He told me the building once belonged to Putnam County Parks and Recreation. These days, it’s used by the county maintenance department when a temporary shelter is needed. They’d placed it at Dacco while a new office was under construction. The same plan was used last year when the Gentry and Bloomington Springs convenience sites replaced their old offices. The only difference? Jolly old Saint Nicholas didn’t hang out at those locations. The Dacco convenience center, located just off Interstate 40 at exit 290, is open from 6:30 a.m. until 6:30 p.m. every day but Thursday and Sunday. 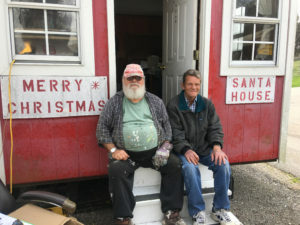 Paint recycling, with Santa in charge, is open Tuesdays and Saturdays from 10:30 until 3:30. If you want to experience Christmas-in-springtime for yourself, don’t delay. It won’t be long before the Santa House goes back to the North Pole.